After months of breathless anticipation — Can Johnny Depp sing? Has director Tim Burton used Sweeney Todd's vile razor to cut out the heart and soul of a classic by gutting one hour of the original Broadway musical? — Burton finally unveiled a huge slice (17 minutes) of his film adaptation of a Broadway masterpiece to a screaming crowd at Lincoln Center Wednesday night. 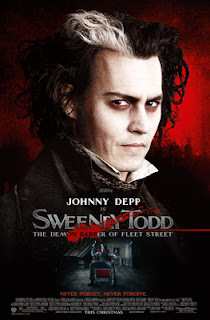 The verdict based upon the crowd's riotous ovation at the end: "Sweeney Todd" is a serious contender to win the Oscar for best picture, just as I've been telling you for months. Much ballyhoo is being made about Dreamgirls right now as being the Oscar front-runner. Here's the problem...no one has seen it yet. The Phantom of the Opera was touted as a frontrunner two years ago, as was Rent and The Producers last year. And let us not forget that before anyone had seen it, Alexander was the one to beat in 2004 (HA!). So it's still up in the air. I ended up predicting Dreamgirls to be nominated after the buzz became impossible to ignore, but my initial misgivings about the film proved to be accurate. That film also debuted a 30-minute clip reel at Cannes to great reviews. It was touted as the Oscar frontrunner. But it wasn't nominated, replaced instead by Clint Eastwood's vastly superior Letters from Iwo Jima. This must be kept in mind when reading articles such as this. Is Mr. O'Neill trying to curse Sweeney? Or did he just not learn from last year's mistakes? He's been telling us it's a serious contender to win for months, that much is true. But he did the same thing about Dreamgirls last year. He may be right this year, who knows. But I'm having a much harder time taking his word on this seriously this year.